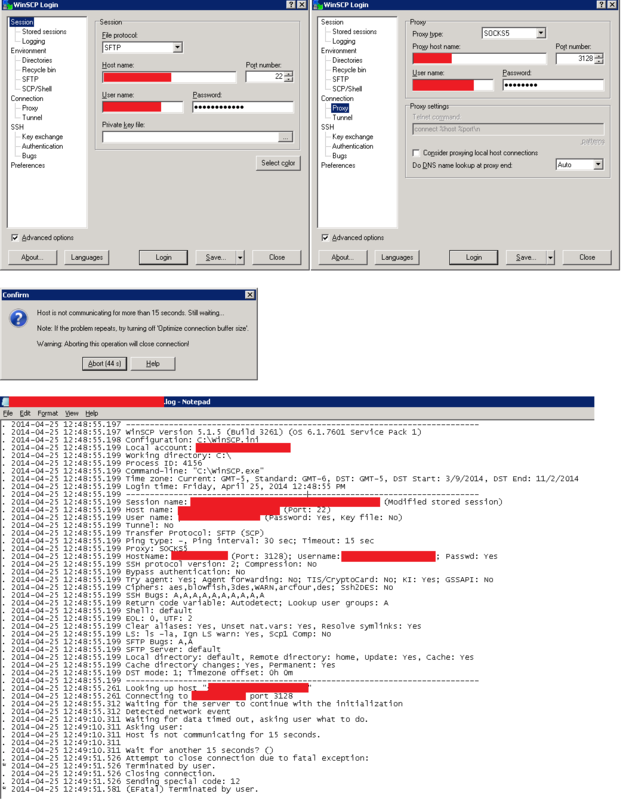 Trying to run WinSCP.exe from a client server to connect to my company's SFTP. I have successfully done this at 10+ clients, but this client will not work. Normally I simply fill out the "Session" tab information, and can connect. I was getting an error saying "Connection Refused". The client suggested that I try using a proxy, and gave me the information I should need. From the screenshots, you can see that I entered it in with no luck. I don't really even get an error, it just sort of times out. I tried all different "Proxy Type" options, and none worked. I am a SQL Server/SSIS/SSRS developer, not a network expert. I have no idea how to dig in and debug this. Any suggestions? Thanks! Re: Host is not communicating for more than 15 seconds. Does their firewall allow outgoing SSH connections at all?